12/12/12 Note: Re-posting this in celebration of being given the opportunity to appear on The Regina Brett Show on WKSU in Cleveland. Miracles do happen! Months ago, this was the My52WOW Book Club pick, and now I get to speak to the author, who I think is just amazing. The show will air Saturday, December 15 at 3:00 pm on 89.7 WKSU and on all of their repeater stations. It will also air on Sunday, December 16 at 6:00 am. For more information, visitwww.wksu.org/regina. So, yes, the My 52 Weeks of Worship Book Club is in still in force. Due to a great deal of travel in the past couple of months, I have started, stopped, restarted, and completed a number of books simultaneously. I figured I would share them with you as they are all part of the My52WOW Book Club! All, amazingly enough, were gifts from friends, who know I love to read. Unsurprisingly, I also have a number of friends with healthy spiritual lives – whether they are searching, convinced, or somewhere in between. The first book I have to share, was given to me from my dear friend, Gretchen. Gretchen is the kind of friend that I can go to anytime, to share anything. She is always there with a kind word and a nonjudgemental shoulder to cry on. She is the kind of friend that is simply, a gift from God. She knows my heart, and she knows how I think. And she knew that I would love, love, love the book that has now become part of the My52WOW book club. And I did! 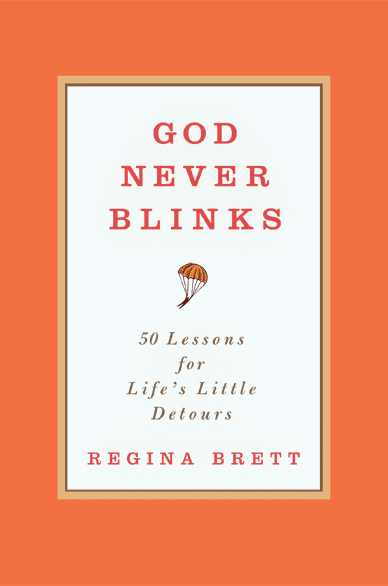 The book, God Never Blinks: 50 Lessons for Life’s Little Detours, just delicious. From the very beginning to the very end, Author, Regina Brett shares her life and the wisdom she has gathered along the way in a way that had me completely captivated, from the very beginning of the book. It is 50, easy to digest chapters, that I devoured in a day. It is the kind of book that I know I will read and re-read, learning more about myself every time that I read it. I highly recommend it – especially if you are looking for very practical, deeply touching, stories and wisdom. I.loved.this.book. Simple Wisdom. My favorite. The next book that I am about halfway through was also a gift. Some may remember that one of my first radio appearances was on the Optimistic Diversity Radio Show. The host, Jason Henderson, is a good friend of mine, and a constant source of positivity and encouragement. When he gifted this book to me, he simply said – “I know you love books, here is one for your collection.” The name of the book is Strength to Stand: Overcoming, Succeeding, Thriving, Advancing, Winning, by Bishop T.D. Jakes. I have never been to Bishop T.D. Jakes’ church. In fact, during The First 52 Weeks of my spiritual journey, I did not really attend any mega-churches, subconciously opting for smaller churches for the most part. But I am soaking in a decidely Christ-centric book, and learning what T.D. Jakes believes and suggests. I believe that knowing the source of your strength is a wise thing to do…here, I will get a chance to further explore that. I encourage you all to read this as well and let me know what you think. The last book, which I actually started first, is called simply, Worship: More than a Song. The author is Dr. Norvel Hayes. This book was gifted to me by one of my older sisters, who is simply convinced – and who has no problem sharing it with me. When I shared the My 52 Weeks of Worship story with The City Light congregation, Chicago, one of three Chicago congregations that I frequent, now in the 3rd year of my project, Pastor Omo asked me in an interview – How do you define worship? In this book, I am able to read about the definition from the perspective of Dr.Norvel Hayes – and determine why my sister thought it would be important for me to read this book! So, I am planning to finish reading these last two books in the near future. Ramadan is approaching, and I would like the next Book Club book to be about Islam – although I don’t know what that book will be. If you have suggestions, please let me know! I was honored and humbled to share my story on your show. Your book touched my heart, and has touched so many. Thank you for your kind words about me, my journey, and my book. May God continue to bless you on your journey – and I can’t wait to read your new book, “Be The Miracle!”. Merry Christmas, take care.